Want evidence that Tiger Woods is the greatest player of our time? 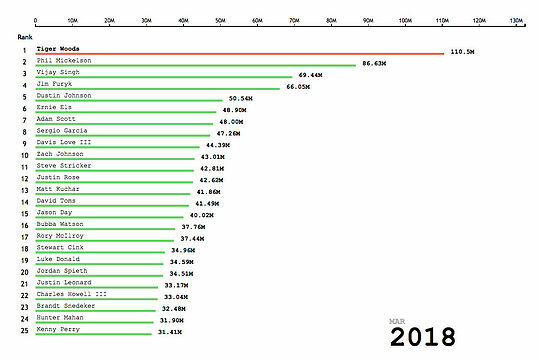 Then check out the graphic that Data Golf has produced which shows the startling rise through the earnings rankings of Woods as he soared through the rankings and eventually became the long-serving No.1 player in the world. View the stunning earnings visualisations beginning in 1983 at Data Golf. It is quite awesome to watch the greats of the game, Nicklaus, Palmer, Norman, Kite etc come up through the earnings rankings and jostle for positions at the top of the table until Woods appears, like a bolt out of the blue and watching year-by-year, month-by-month as he scales the earnings ladder to sit comfortably at the top. The Data Golf table actually begins in 1990 with Tom Kite in the prime position at the top until Greg Norman overtakes him in June, 1995. But once Tiger, who didn’t turn pro until the following summer, jumps to the top spot in March of 2000, he is in a class of his own. Just to put this staggering table into perspective, before Tiger’s 2009 scandal broke, he had earned $92.86m in 13 years as a professional. At the time, Vijay Singh was second at $60.55m and Phil Mickelson was third at $55.75m. Despite the fact Tiger hasn’t been the same force in the past decade, by the end of 2018, he still held a similar lead over his two closest followers with $115.2 million in earnings compared to Mickelson ($88.07) and Singh ($69.52). Obviously that makes sense considering Woods’ 80 career PGA Tour titles is more than the combined 78 wins of those two players. Woods passed the $100m mark in September, 2012 and six-and-a-half years later, no one else has come close. Next best is Mickelson, who passed $90 million earlier this year, but he will be 49 in June.